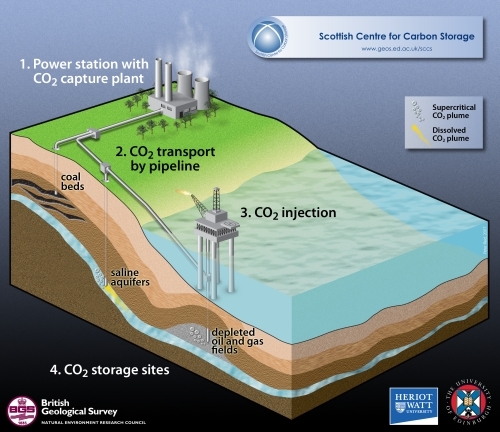 The French magazine Science et Vie published this month a most interesting article on why Carbon Capture and Storage (CCS) won’t be able to deliver all its promises of mitigating climate change. Indeed to many international scientific experts putting carbon to the ground is too risky, too expansive, too little and… too late ! This may seem quite lapidary but as we will see it’s the truth. This is quite surprising as it contrasts importantly to the important investments in this area. Indeed, with so much money one could think it would be an idea solution. Mankind is emitting 1,022 tonnes of carbon dioxide each second, an approximate for the 32 billion tonnes per year (Source: Global Carbon Project). One of the solutions thought by industrials is to bury the problem. Out of sight, out of mind ? Even if the risk is quite small, any leak of carbon dioxide from underground could kill thousands of people as it occurred in the Lake Nyos in 1986 in Cameroon. To the US Department of Energy the construction budget of such plants would increase by 36 to 112 percent compared to traditional ones. Similarly, the IEA estimated that the cost of construction would increase by 57 percent and that the price of kWh would almost double. Another example is Futuregen in the United States. To date the project has been stopped as the budget had doubled compared to the plans. To Global Chance, CCS would bring a marginal solution by 2030 as it would be able to avoid as few as three percent of the emissions induced in a business as usual scenario. Similar findings have been evoked by a French institution, the BRGM. Technological maturity won’t occur before twenty years or so. Meanwhile, climate change has to be solved as soon as possible. If CCS won’t indeed solve any of our energy and climate problems, it is a solution among others. Meanwhile, energy efficiency could be the solution to our problems. Indeed, it’s doesn represent any risk, is the cheapest solution, the potential is absolutely gigantic and it’s perfect timing to launch such programs. Nonetheless, American and European governemnts are investing as much as four times more in CCS than in energy conservation. It is high time this changes ! To be honest, I don’t think cost is really an issue. In the end, we regard electricity as a necessity, so we’ll pay just about any price for it. The real problem with CCS is that it’s a crock. It’s just not been shown to work, and even if it did work perfectly and tomorrow it’d take decades to put into place. It just takes time to build things. You know, concrete, steel, qualified engineers to supervise it all, and so on. It wouldn’t give us the emissions reductions we need quickly enough. To deal with just one-tenth of current emissions would require a CCS infrastructure about the same size as our entire world oil industry’s infrastructure – which took a century to build up. One-tenth? Nothing – our annual rise in emissions would chug that up in a few years. As I said earlier, fossil fuels will decline in availability in the next few decades anyway – that won’t give us a quick enough reduction in emissions to prevent catastrophic climate change, but it’ll be a stronger reducing effect than even a perfect CCS scheme would be. CCS also face the problem that renewables do, that politically they’re often misused – we need them to substitute for fossil fuel use, not add to it. For example, if you have an island nation with 1,000MW of coal power, they might add 250MW of wind and solar, and they don’t turn off 250MW of coal, they keep it and say, “look! we’re 20% renewable!” and everyone thinks they’re less polluting now, but… still the same amount of coal is being burned. I think CCS, if it could be made to work (which again, is extremely unlikely), would have the same problem. Reduce, reuse, recycle. People like to forget the first part. As for spending on efficiency… well, I’d say first let’s reduce by spending less. It doesn’t cost money to turn things off when they’re not being used, or when you don’t really need to use them, it saves money.